Ganymede is a figure who appears in tales of Greek mythology; Ganymede was not a god of the Greek pantheon, but was a mortal. Ganymede though, was not a hero, nor a king, as is the case of most famous mortals in Greek mythology, but Ganymede was a prince who found favour with the god Zeus because of his beauty. Ganymede was one of the Dardanoi, the people who inhabited Dardania in Asia Minor; indeed Ganymede was the great-grandson of Dardanus, the early king who migrated to the area, and named his new kingdom after himself. Ganymede in fact was the son of the king of Dardania, Tros, at the time of his birth; and thus the Naiad Callirhoe was the mother of Ganymede. 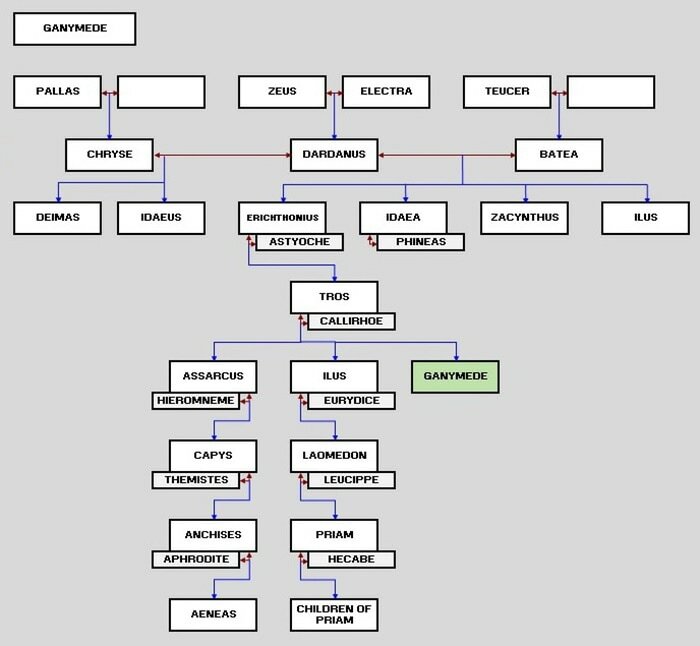 Ganymede was not heir to the throne of Dardania though, for he had an elder brother, Ilus, as well as another brother, Assarcus. Ilus, after the death of Tros, would give up the throne of Dardania, passing it to Assarcus, whilst he himself established a new city, Ilium, the city that was also known as Troy. Ancient Greece was a land of many kingdoms though, so the title of prince did not set Ganymede apart from countless others. Ganymede though was special into the eyes of the gods, for Ganymede had the reputation of being the most beautiful of all mortal men. The beauty of Ganymede was sufficient to have even the gods lusting after the mortal prince; and it was the most powerful of the gods, Zeus, who acted upon his desires. Zeus looked down from his throne upon Mount Olympus, and spied Ganymede looking after the livestock of his father Tros. Ganymede was alone, and so Zeus dispatched an eagle to abduct the Trojan prince; or else Zeus transformed himself into that eagle. Ganymede was therefore plucked from the land of his father, and carried rapidly to the palaces of the gods upon Mount Olympus. Ganymede would become the lover of Zeus. Ganymede had no way of letting his father know what had happened to him, and Tros knew simply that his son was missing. The loss of his son caused Tros to become overcome with grief, and from Mount Olympus, Ganymede could see the pain that his father was in. Zeus therefore had no choice but to do something to comfort his new lover. Zeus dispatched his own son, Hermes, to Dardania to inform Tros of what had happened to Ganymede. Thus, Hermes told Tros of Ganymede’s new privileged position upon Mount Olympus, and the gift of immortality that went alongside it. Hermes also presented Tros with gifts of compensation, gifts that included two swift horses, horses which were so quick that they could even run over water, and a golden vine. As well as lover of Zeus, Ganymede was given the role of cupbearer of the gods, serving the ambrosia and nectar served at the gods’ feasts. ​Now whether Ganymede usurped the role of Hebe, the previous cupbearer of the gods, or not, is open to debate, although Hebe was destined to become the immortal wife of Heracles, so the role was to become vacant in any place. Aside from his initial abduction, Ganymede is not a central figure in any more tales, although the prince does appear in tales of the Trojan War. The Trojan War of course saw a 1000 ships full of Achaean troops land on the Troad, and so the Dardanoi and Trojans fought side-by-side to defend Troy. 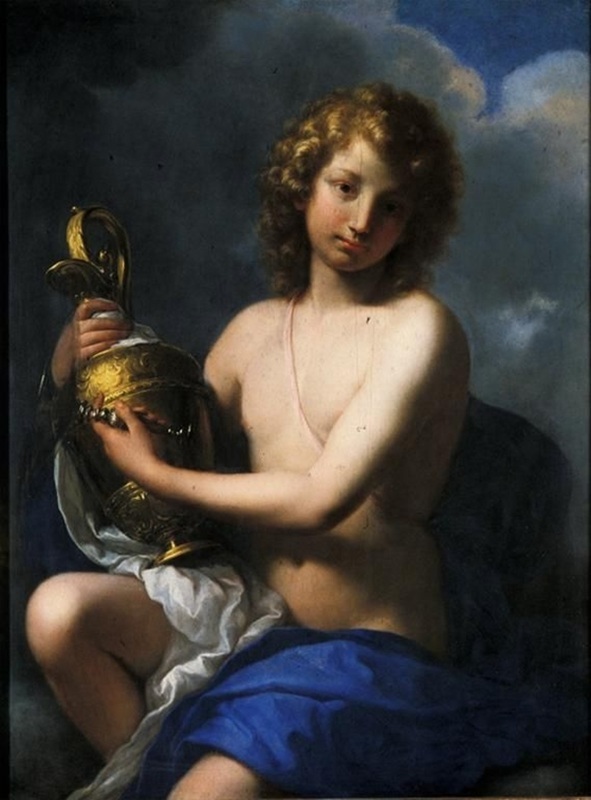 ​The death and devastation brought to his homeland greatly upset Ganymede, and as a result he was unable to undertake his role of cup-bearer of the gods, and so Hebe, briefly took up the role again. When the war came to an end, and the Achaeans under Agamemnon eventually entered Troy, Zeus clouded the view from Mount Olympus, so that Ganymede would not observe the end of the city of Troy. 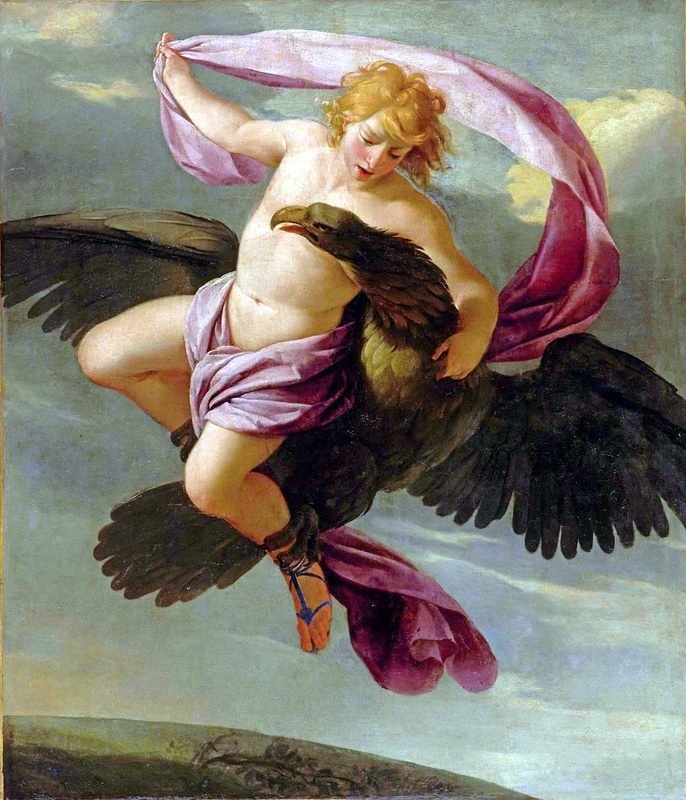 The love of Zeus for Ganymede was such that the supreme god was said to have placed the likeness of Ganymede in the stars as the constellation Aquarius; Aquarius being just below the constellation of the abducting eagle, Aquila, in the night sky. Some writers in antiquity would also give Ganymede semi-divine status, naming Ganymede as a god who brought forth the waters that fed the mighty Nile River; although there was a Potamoi, Nilus, who also filled this role.